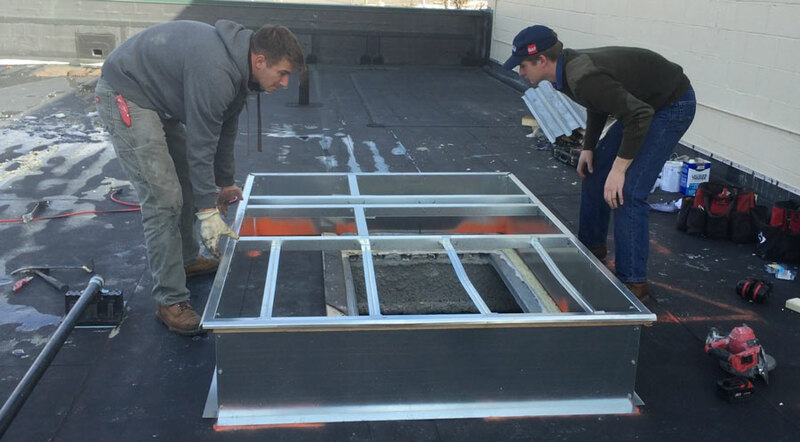 Flat roof curb installation for an air conditioner in Connecticut. We serve Pittsburgh, Monroeville, Stamford, Greenwich, and White Plains, CT. The Bow Tie Royale 6 Cinema contracted Commercial USA to install an air conditioning unit on the flat roof of 542 Westport Ave., Norwalk, CT. The curb was supplied by the The Heating and Cooling Company located in Norwalk, CT. Mike Tavolacci marked exactly where the curb would be positioned on the roof. 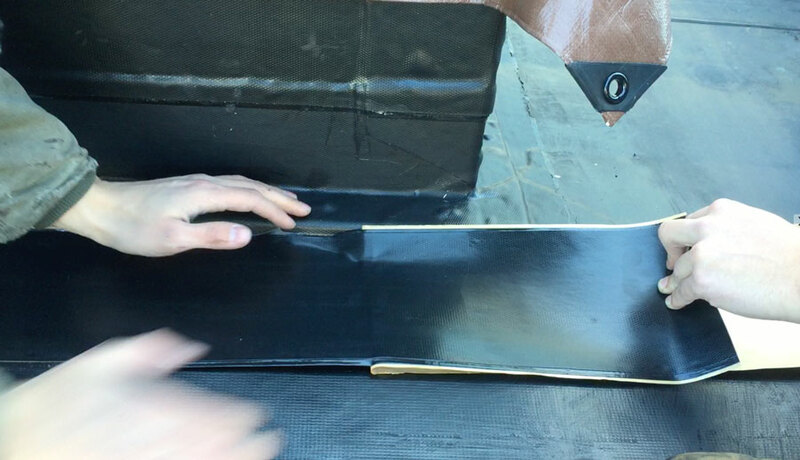 The curb in the video below was installed on an EPDM single-ply roof membrane. 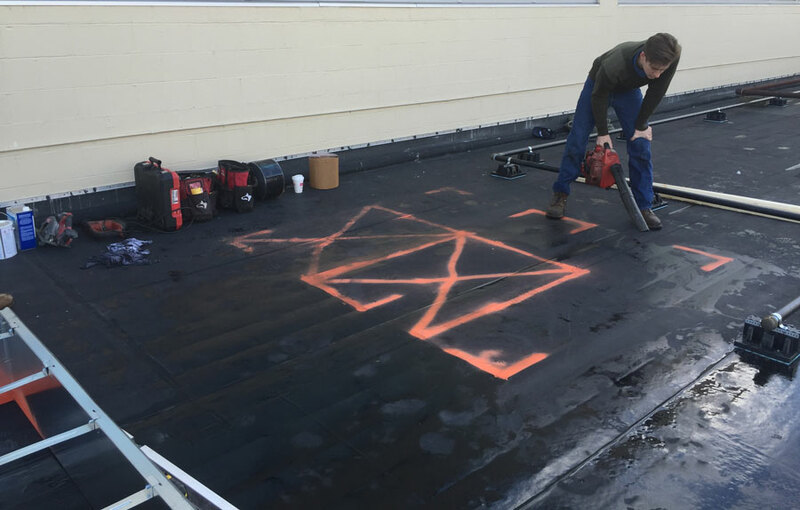 We cut the EPDM rubber exactly where the markings were. Then, we removed a 3″ insulation isoboard. Under the the insolation was a 5/8″ gypsum board. 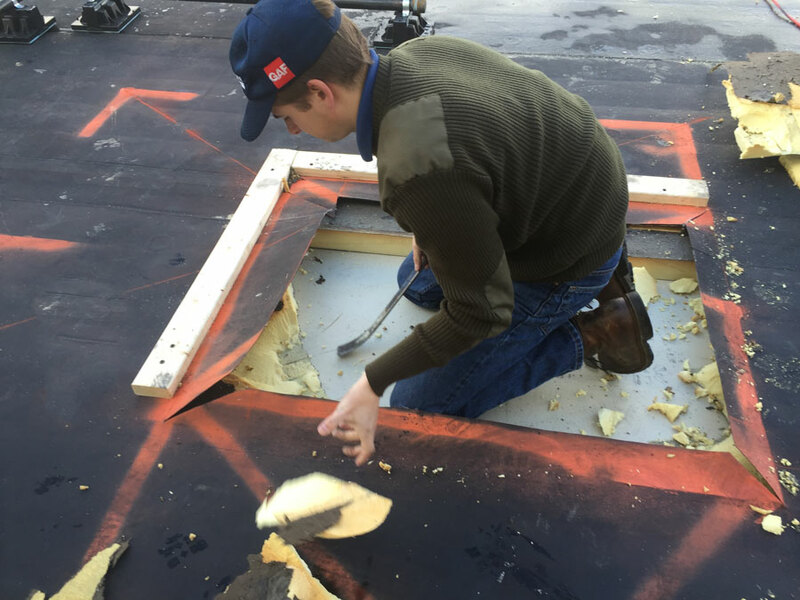 After removing the the rubber, insulation, and gypsum board we had to cut through the metal sub roof. The opening through the metal roof was for the intake duct to the A/C unit. After the opening was made for the duct work, we then placed the curb in position. Because the roof is slightly slanted, one side of the curb had to leveled with boards. After leveling the curb, we anchored the curb down with 4″ screws to the metal sub roof. After positioning the curb and anchoring it, we could vulcanize (to improve the strength, resiliency, and freedom from stickiness and odor of the entire curb). 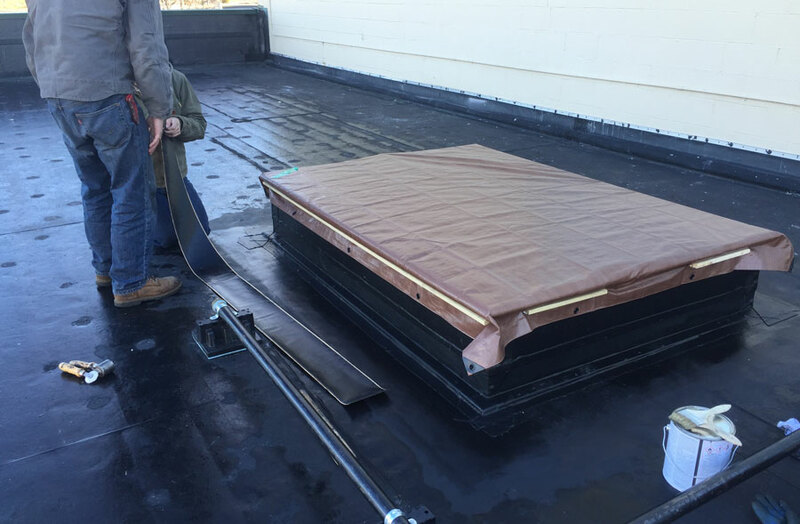 We installed a EPDM cover tape on the entire curb, and then carefully added the flashing as well to tie it into the existing rubber roof. Make sure all the measurements are correct and the location is properly marked. Prep surface area by removing all debris and water. 3. Cut the rubber and insulation away to expose the metal sub roof. Before cutting through the metal roof, make sure there are no electrical wires or any other objects that could get damaged during the cutting process. Remove the rubber roof material and insulation to expose the metal sub roof. 4. The metal sub roof. This is what it looks like under all the insulation and the EPDM rubber. The metal roof. Use a metal reciprocating saw to cut the section out. Extreme caution must be taken during steps 3 and 4 because there could be electrical wires under the metal roof. In this case a drop ceiling hanger wire was attached to the the metal so we were fortunate enough to remove it without disturbing the drop ceiling. The metal roof had to be cut with a reciprocating saw. Since the roof was slightly slanted, we had to lift the curb by 5/8″ on one side to get it level. It is important to have it absolutely level; if it is not level, the bearings will wear of faster on the A/C unit. After removing the roofing material and cutting open the intake access area, we could place the curb in place. The roof is slightly slanted and it was necessary to level the curb before we started to install the flashing. We used 5/8″ wood strips under the one end of the curb. 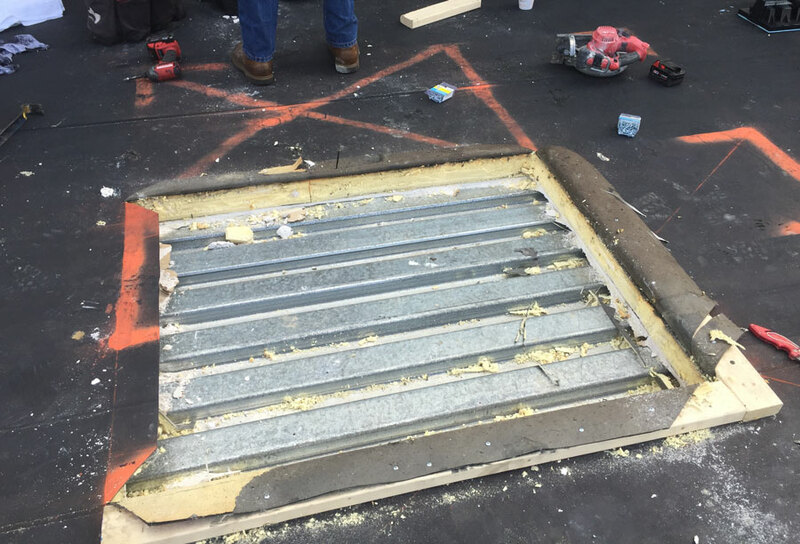 After getting it level we secured the curb to the roof with 4″ screws that held is into place. This air conditioner curb had to be leveled before we could flash it in. 7. Vulcanizing and flashing the air conditioner curb. Once the curb was leveled we covered the entire outside of the curb with EPDM cover tape. To flash the curb in, it is necessary to clean the surface very well. We used lacquer thinners and rags to remove all the oxidation form the surface where we needed to adhere the new EPDM cover tape. After the cleaning, we brushed primer to the surface and waited for it to dry. After a touch dry test, we installed the cover tape and flashed the entire unit in. It is essential to clean the surface form old oxidation before installing the flashing. 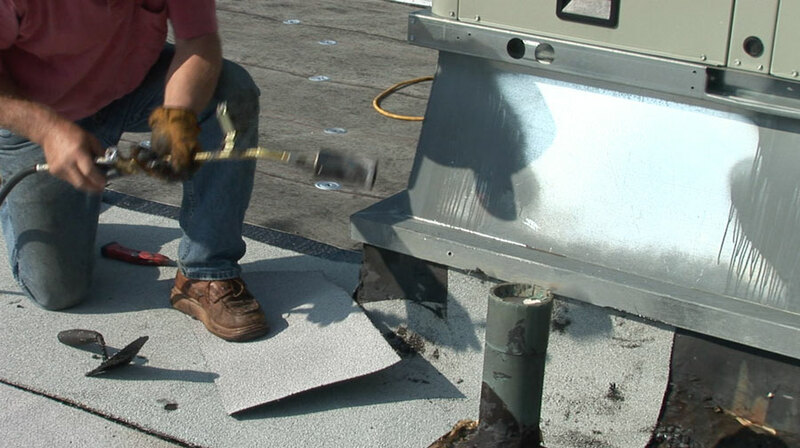 In the case of a EPDM roof, it is necessary to use compatible material to do the flashing. In this case we used EPDM cover tape. It is very important to use a roller to roll the cover tape so it can propely adhere to the EPDM rubber. 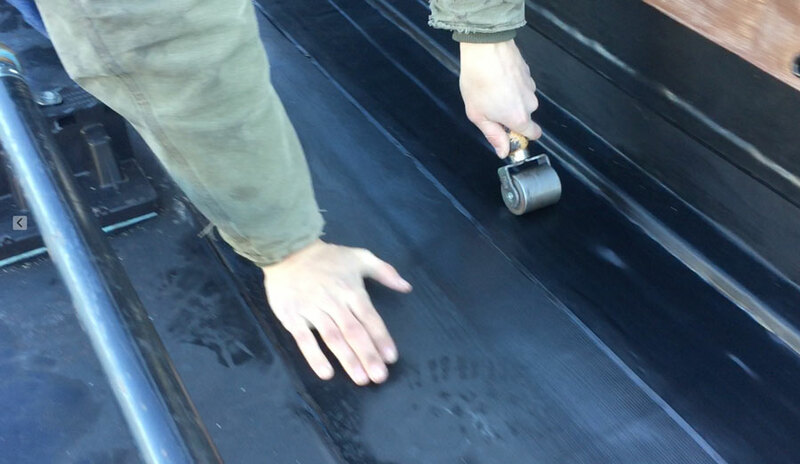 It is important to roll out every inch of the cover tape to get a secure bond to the EPDM rubber roof. 9. Cover the curb with a tarp. It is difficult to coordinate two different trade crews to complete a A/C unit installment on the same day, but if the A/C contractor marks out where the curb will be installed and leaves the curb on the roof, we can then notify them when curbing has been completed and is ready for the A/C installation. After installing the curb we cover it with a tarp. The A/C contractor can schedule a time to install the unit. Whenever there is curb to be installed or flashing that needs to be done, it is important to use compatible materials. On an EPDM roof, only EPDM materials and be used. 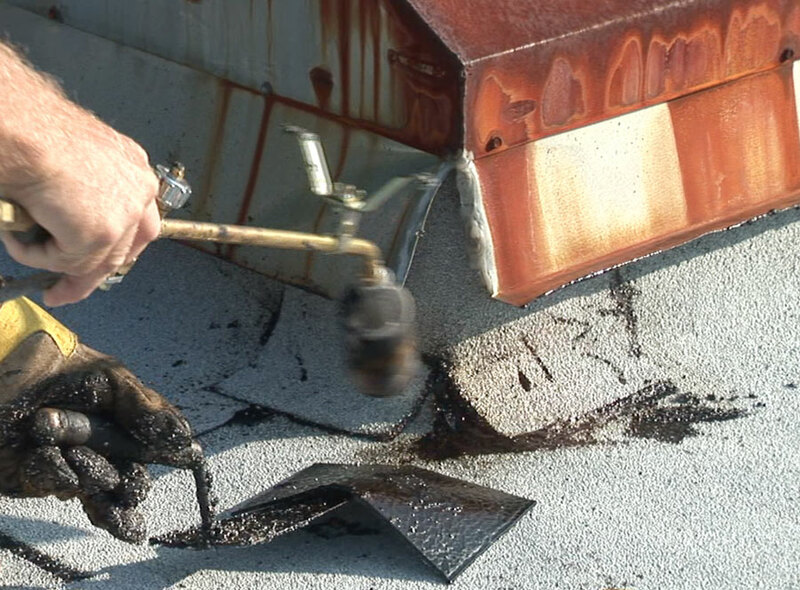 The same principle applies to a Modified Torch Down roof; only Modified Bitumen materials should be used. Sometimes, we find that this principle is not practiced by other roofing contractors. In the images below we are flashing a curb with Modified Bitumen Membrane Torch Down material. The image image below is also a Modified Bitumen Membrane curb installation. 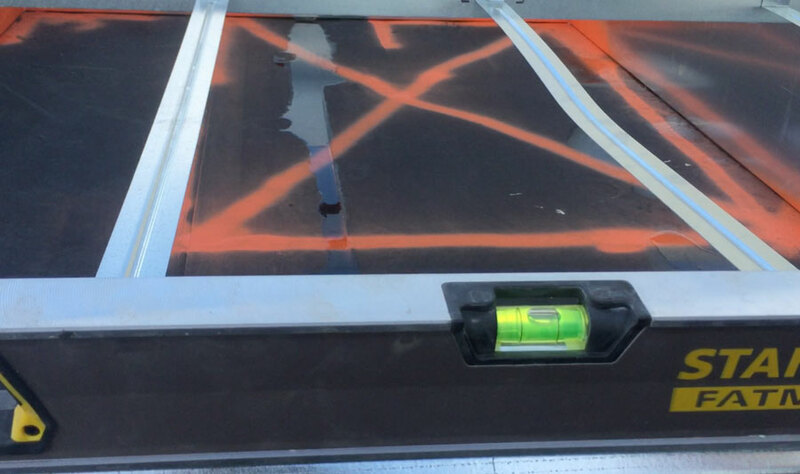 It is essential that a special tar be used to try and seal any flashing, but it should be used very sparingly. Installing a curb is a very important and should only done by professionals. When the curb is installed on a Modified Bitumen Roof, it’s important to use the same material to do the flashing.
) I care foor such information much. I was looking for this particular information for a vsry log time. I am glad you enjoyed it. What I don’t get is you did this for SEO purposes and I could not see how you could benefit from this comment. Hi, my name is Rebecca, and I just wanted to send you a quick message here instead of calling you. I discovered your Air Conditioner Curb Installation- Flat Roof – Watch Video page and noticed you could have a lot more traffic. I have found that the key to running a successful website is making sure the visitors you are getting are interested in your subject matter. There is a company that you can get keyword targeted visitors from and they let you try their service for free for seven days. I managed to get over 300 targeted visitors to day to my website. I was just looking at your Air Conditioner Curb Installation- Flat Roof – Watch Video site and see that your website has the potential to get a lot of visitors. I just want to tell you, In case you didn’t already know… There is a website network which already has more than 16 million users, and the majority of the users are interested in websites like yours. By getting your site on this network you have a chance to get your site more popular than you can imagine. It is free to sign up and you can read more about it here:- Now, let me ask you… Do you need your website to be successful to maintain your business? Do you need targeted visitors who are interested in the services and products you offer? Are looking for exposure, to increase sales, and to quickly develop awareness for your website? If your answer is YES, you can achieve these things only if you get your site on the service I am talking about. This traffic network advertises you to thousands, while also giving you a chance to test the network before paying anything. All the popular sites are using this service to boost their readership and ad revenue! Why aren’t you? And what is better than traffic? It’s recurring traffic! That’s how running successful website works… Here’s to your success!